These photographs are examples of symbols and motifs that beautifully reflect both faith and tradition. 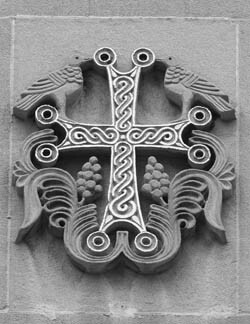 A complex of classic nature motifs from the Armenian Church, symbolically rendering Christ’s loving sacrifice, the Holy Spirit and Gospel message, and the life-giving power of the Holy Cross. 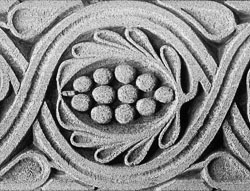 From a carving above the door of the Diocesan Center in New York. 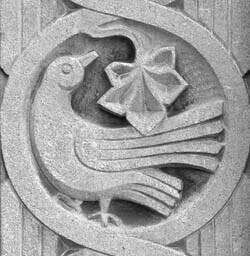 A dove carving from the doorway of the Diocesan Center in New York, conveying the presence of the Holy Spirit. A carved cross from the face of St. Vartan Armenian Cathedral, featuring classical Armenian motifs from nature, as well as the intricate weave that represents eternity. A cluster of grapes and a shock of wheat, enclosed in a never-ending tendril of vine—images that resonate deeply throughout the Holy Gospel, and also represent the elements used in the sacrament of Holy Communion. 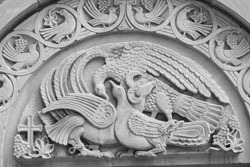 A carving from the doorway of the Diocesan Center in New York. St. Ashkhen, Armenia’s pious queen who encouraged her husband, King Drtad III, to convert to Christianity and to proclaim Armenia as the world’s first Christian nation, in A.D. 301. 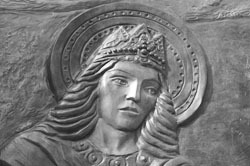 A bronze relief from the entry portal to St. Vartan Armenian Cathedral, in New York. The Armenian culture is extremely rich in both simple and complex ornaments, designed by generations of artists. This new ACEF logo icon is based on a detail from an Armenian manuscript. The lines and arrows emanating from the center suggest ACEF’s role in successfully navigating complexity.